First up I've got the wonderful blog Reflection of Sanity from Shireen who is just one of the kindest girls I have come across. She has been supporting my blog for a while now and I always appreciate her lovely comments. Not only that but she has an amazing blog of her own that is honestly worth your time checking out. You will find great posts on beauty, recipes and general lifestyle, with a unique style of writing and a witty humour, that always manages to put a smile on my face or has me nodding along in agreement. Cluttered Closet is another favourite beauty blog of mine, where Kal posts about a variety of products and does so really well. I am either adding the products she reviews to my wish list or crossing them off as I know straight away from her informative reviews wether it will be suitable for me. I love that her reviews vary from high end to drugstore because there's something for everyone. Recently I have also been loving her blogging/social media tips which are really helpful so don't waste any more time and check out this fantastic blog. 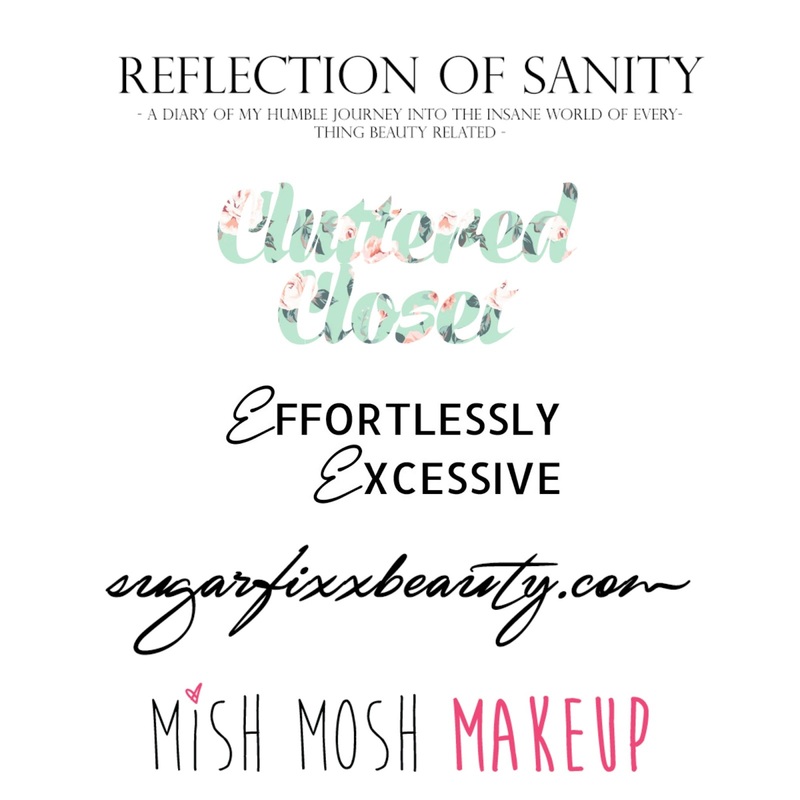 Sugarfixxbeauty is the brilliant blog written by Kate, who is another makeup junkie like me so I love reading her posts and being able to relate to constantly wanting to buy all the beauty products. Her reviews are based on a variety of drugstore and high end products, which I really love and I am forever adding things to my wish list after a quick visit on her blog. She also has a fantastic Youtube channel which I regularly keep up to date with because I love her bubbly yet genuine personality. Definitely worth checking out her blog and having a peek at her Youtube channel as I'm sure there's bound to be something yo will enjoy reading/watching. Last but not least is the gorgeous Jenny and her incredible blog Mish Mosh Makeup, where you will find plenty of make up tutorials, products reviews and general lifestyle posts. Her makeup looks for me personally are just amazing, she always looks stunning with any of the looks she creates and instantly makes me want to try them out for myself. I also love reading her product reviews as there's always something in there I haven't heard about or am yet to discover, even if it means I have a huge wish list of US products now. Do give her blog a quick visit and check out one of her makeup looks, the most recent one is Victoria Secret inspired and it is flawless.